Keep your office looking neat with the Sequel Office Desk. It has panels that keep wires controlled and out of view. The Sequel Office Desk is the cornerstone of the Sequel Office collection.The multifunction system drawer provides the ideal spot for a keyboard, mouse and rechargeable items. 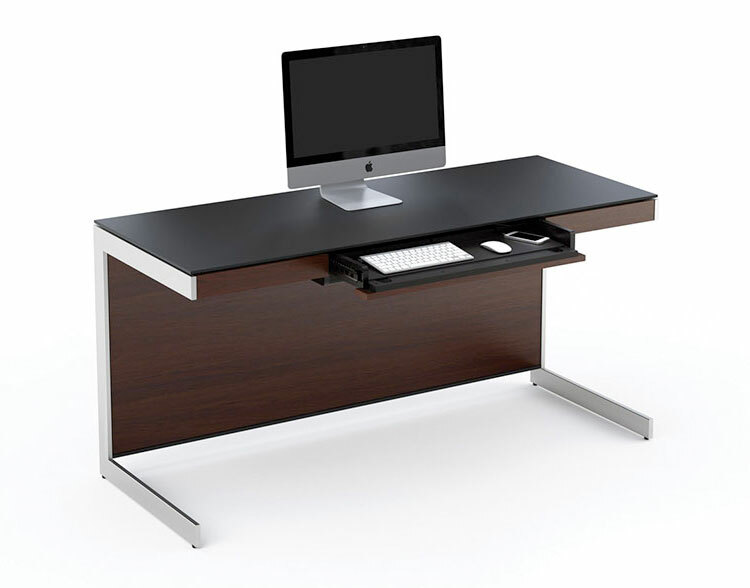 The Desk includes magnetically attached front and back panels making it easy to keep wires controlled and out of view. When positioned against a wall the back panel may be removed for direct access to wall outlets. Everyone needs a workspace that is comfortable and inviting, and if it can be beautifully designed and neatly organized that’s even better. Designed with an emphasis on ergonomics and organization, BDI’s office furniture is engineered to integrate today’s office technology while offering the ultimate in style, function and flexibility. Whether you are creating a small home office or a complete corporate environment, there’s a BDI solution for any application. The Sequel Office furniture system is designed to manage technology and create a comfortable and organized home or small office. Uniquely integrated features such as cable management, a built-in recharging station, and easy-access panels are all designed for ease of use and lasting enjoyment.